Hip, Hip, Hurrah! We're done with the last days of the challenge!!! This is my picture of the Aran Islands, Ireland: Since I read Francie on the Run by Hilda Van Stockum(Irish, American and Dutch author), I have wanted to go to Ireland and in particular, I want to go to the Aran Islands. I must go down to the sea again, to the wild sea and the sky, and all I want is a tall ship and a star to steer her by......Now I've got sea fever again! And here's Anna's picture: What do you know! It's the sea! I can just hear the mewing of the gulls,the pounding of the surf, the wind blowing and I can smell the salt air and the artificial waffles that you eat in the Chincoteague hotel....You might think we're elves the way we long for the sea! And next is Lydia's picture: The hawkwatch at Braddock Bay, Hilton New York. We went to the Bay of Belfalas once and I think Lydia got to go to that wood platform and see the hawks flying over the Bay, but I'm not sure. She wants to go for the spring raptor migration. We all want to go to such wet places, "WATER! WATER!" (said Sam hoarsely). And on to...The congratulation banners (The green flag of Rohan and the blue of Dol Amroth and...): Mine is first again: Me with the badly spelled banner proudly waving aloft and Mount Doom exploding in the distance as the eagle flies off with never mind who...I have thrown my pictures on the ground in triumph and scattered the pencils in the grass (not really) and wave the flag with glee, crying "Hooray! I can draw whatever I want!" Not that I disliked the challenge, o no, it was awfully fun! Here's the picture drawn by Anna: She can spell. (pout pout) Hers is a cool, cool dragon! Mayhap Bard will shoot it with Black Arrow (and we'll all cry "Up with the bowmen, down with moneybags!") And I must say that the border is velly nice! Now Lydia's is the coolest of the lot! And all her drawings are fluttering in the breeze - you can see (if you look closely) the one of Shadowfax and the Gryfalcon and the apple and the other stuff of that sort. Also note the Whooping Crane as the figure head! Notice the gleeful smile as she throws all her drawings to the winds! Thus endeth the post of the last days of the Third Age....O, bother! The last days of Pompeii....No good! The last days of the Age of Sail...NOOOO! Make a final effort...THE LAST DAYS OF THE DRAWING A DAY CHALLENGE!!!! Hooray! I said it! A million thanks to Shealynn for hosting this fun challenge! Thank you, Shealynn! So, goodbye now.... So here's a health to the company, and one to my lass, let's drink and be merry... for we may and might never all meet here again. Glory and trumpets! Pow! Zowie! Wham! Well, all the livelong day yesterday I wrote and I wrote 'til my eyes bugged outer my head and I almost lost my wits but, at the last I finished at 11:48 P.M. 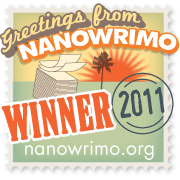 I had plenty of time- even when my novel had been validated, there were nine long minutes left in the day! I didn't want to stay home from the Boys' concert and miss Joey on the bang-bangs and Jonny on the tuba. So I took along the phial of Galadriel (a light when all other lights go out) and wrote in the car. And during the concert I wrote by cell-phone light! Alas, alas! I was scribbling through the Variations on America by Charles Ives and hardly noticed and didn't once get to see Josiah do the suspended cymbal. (Sob, sob,They cried sadly) It really was sad. But it was a risk we all took. Even after we got back, I had to be locked in a tower in Minas Tirith to finish. Or was it my garret? Igh. I wrote like 7000 words in one day. And I went to bed and closed my eyes and saw...A Page...and my brain continued to generate vague text pertaining to the story...Aaahhh! Knock it off brain! (they commanded wrathfully) And now at last the mad Adventure in NaNoland is over. Look! Well, it was a jolly time. But now it's December and we have made a great discovery: There is, after all, more to life than writing. Painting birds, and practicing your Chopin, and maybe even doing Algebra or chores. Wow, I never knew that!